The treatment of kidney stone disease has changed dramatically over the past 30 years. This change is due in large part to the arrival of extracorporeal shock wave lithotripsy (ESWL). 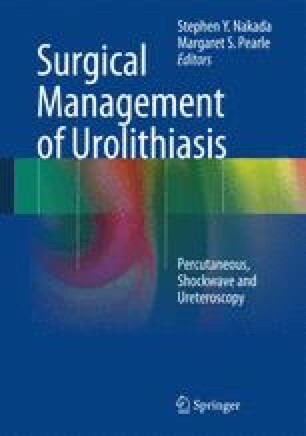 ESWL along with the advances in ureteroscopic and percutaneous techniques has led to the virtual extinction of open surgical treatments for kidney stone disease. Much research has gone into understanding how ESWL can be made more efficient and safe. This chapter discusses the parameters that can be used to optimize ESWL outcomes as well as the concepts that are affecting the efficacy and efficiency of ESWL.